Description Construct a volume by smoothly interpolating picked gather functions. This process converts a function picked on gathers to a single 3D volume. See Using the Gather Picking Panel. A window model defines the structure and function values are smoothly interpolated using inverse distance algorithm. 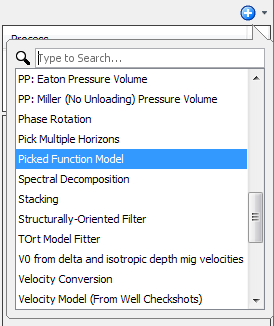 In the Details Panel, at Picked function, select a volume function that you have picked from the Gather Picking Panel. Choose a Windowing model to structurally define the structure of the volume (see Creating a Windowing Model). At the Output Extents section, assign a survey to your output volume. Type the range of Inline extent and Crossline extent and the respective sample intervals. 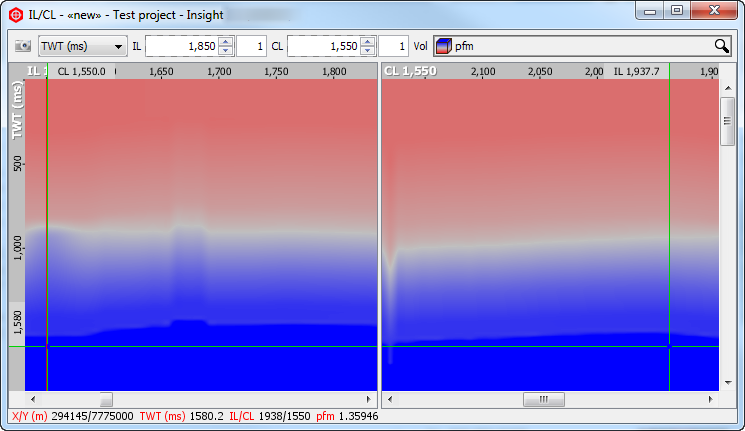 Choose either TWT (ms) or TVDSS (m) as the domain, and type the time/depth extents and sample interval for the model. Inverse Distance — The resultant model will then tie each well. User-specified constant — Allows you to type a constant value for the model in that layer (this is useful to define sensible values outside of the well control depth range; either at depth and/or shallow in the model). As a result of this process, a new volume is added in the Volume tab. 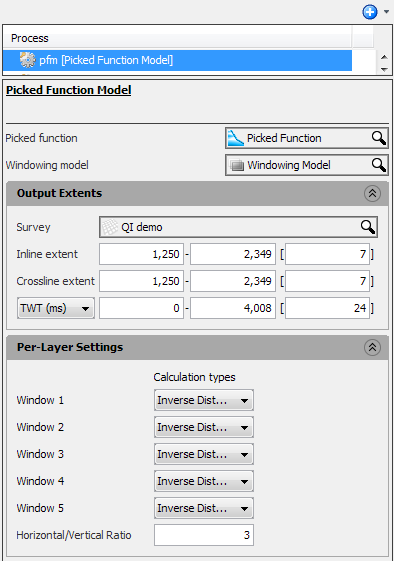 The example below shows the section view of the Picked Function Model as picked in Using the Gather Picking Panel.